This is a guest post written by Hayley Geiselman, who interned with Center for Health Progress for the Fall 2018 semester. Throughout childhood, I underwent a variety of dental procedures intended to perfect my smile. After I had several teeth pulled in one go, my mouth was so numb that I accidentally chewed a hole into my cheek. For the next couple weeks, I was stuck eating only room-temperature foods and had to flush my mouth several times a day to avoid infection. Afterward, I had to relearn how to chew while missing teeth, and find a way to play the clarinet with new hardware in my upper jaw just days before the Winter Concert. These procedures left me in substantial physical and emotional pain. I was embarrassed to smile or eat in front of friends, and was extremely anxious about whatever future dental work inevitably lay ahead. Throughout our lives, mental and oral health remain closely linked; someone suffering in one category is likely to suffer in the other. Symptoms of poor mental health, such as self-neglect and chronic anxiety, result in poor oral hygiene habits, dentist phobias, and increased tooth decay. Depression is associated with higher amounts of caffeine, tobacco, and alcohol intake, leading to tooth erosion and decay. Side effects from antipsychotic, antidepressant, and mood stabilizer drugs (like dry mouth) make users more susceptible to oral disease. The overall effect of these risks results in tooth loss, making mental health patients 2.8 times more likely to have lost all of their teeth. Similarly, those suffering from poor oral health or poor oral hygiene experience lower self-esteem, lower self-worth, and increased social anxiety. In a 2015 American Dental Association study, one in four Colorado adults felt embarrassed about the appearance of their teeth, and nearly one in five experienced anxiety due to the condition of their teeth. Embarrassment and anxiety over teeth were most common for lower income Coloradans, causing them to avoid smiling, to participate less in social activities, and to perform worse in job interviews. 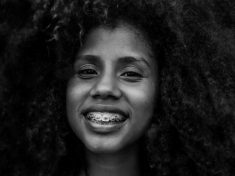 Furthermore, due to the failures of our health care system to adequately serve people of color, Hispanics, African Americans, and Native Americans experience the highest rates of poor oral health in the United States, which places these groups at greater risk of poor mental health, as well. To this day, I continue to have anxiety about my teeth and their care. Although it’s resulted in a few crooked teeth, I’ve refused a permanent retainer because my mental health is too valuable to me to risk invasive procedures that are more about good looks than good dental health. But that’s a choice I’ve had the privilege to make; accessible, affordable dental and orthodontia care from childhood on is not available to many Coloradans, in the same way that accessible, affordable behavioral health care isn’t available to everyone. Our mouths and our brains are, in fact, connected (well, most of the time anyway!). So, it makes sense that the health of our mouth and the health of our brain would also be connected, and they are. There is a lot of work being done on both oral and behavioral health across the state. If you care about improving mental health in Colorado, I hope you’ll also support efforts to improve dental health; and if you care about improving dental health in Colorado, I hope you’ll seek out efforts to improve mental health, too. And while you’re at it, don’t forget to brush, floss, and practice regular mental health self-care!